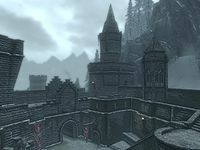 Castle Dour is a large fortress in Solitude which acts as the headquarters of the Imperial Legion and residence of the Emperor in Skyrim. Castle Dour is separated from the rest of Solitude by high stone walls, with two gateways allowing entry. One gateway is on the southwest side and leads to the Wells District of Solitude, while the other gateway is on the southeast side and leads to the Avenues District, as well as the Blue Palace. There are three zones; Castle Dour, Castle Dour Dungeon, and Emperor's Tower. * These NPCs are mutually exclusive; after Battle for Solitude Tullius, Rikke, Aldis and Adventus will be gone, and Istar will be present. Inside the walls is the courtyard where Captain Aldis trains the Solitude guards in archery and swordsmanship using three archery targets and three practice dummies. On the northwest side of the grounds there are two entrances to the castle's interior, one at ground level guarded by two Solitude guards and one at the top of the wall. The Thalmor Headquarters are located at the top of a large stone staircase on the north side. On the east side of the grounds the Temple of the Divines can be found at ground level. The south side of the castle features the Emperor's Tower, located between the two main gates. To the right of this is a grindstone with a wooden table beside it with four iron ingots and two leather strips on top. Entering via the ground floor entrance brings you into an antechamber containing sitting area on the left with a wooden bench against the south wall with a low table in front with a copy of Dwemer History and Culture on top. Against the east wall is a narrow table with a plate of red apples, a bowl of bread and a sliced eidar cheese on top. To your right when entering is a long wooden table with a copy of The Legend of Red Eagle on top and two bookcases beside it holding a couple more common books. Opposite the entrance are double doors leading into the main command center where General Tullius, Legate Adventus Caesennius and Legate Rikke can normally be found planning the civil war against the Stormcloaks at all hours. To the right of the doors is a table with a built-in alchemy lab, while to the left is a table with a built-in arcane enchanter. There are stairs to the north and south. The room containing the general and legates has a pair of long wooden tables placed end-to-end with a large tactical map of Skyrim showing the progress of the civil war, if any, a copy of Mixed Unit Tactics and a couple of rolls of paper. There are many banners unique to the castle hanging from the walls, while against the east wall, to the left when entering is a narrow table with a bottle of spiced wine on top. To the right is a small cupboard with a bowl of bread and a piece of cheese on top. There are stairs leading up in the middle of the south wall. In the southwest corner are a couple of wooden benches with a low table in front. Against the west wall is a small cupboard with an apprentice-locked display cabinet on top containing an iron sword. In the middle of the north wall is a door leading to the legate's quarters. To the left is a chair and at the rear of the room, in the northwest corner is a small cupboard with a wardrobe and set of shelves in an alcove to the left. On the shelves are two quicksilver ingots. Legate Adventus Caesennius' quarters consist of one large room separated into three sections. On the right upon entering is a storage area with stacks of cf crates and a tall wardrobe containing clothes. The middle area is a work area with a wooden table and chair being used as a desk with a copy of The City of Stone on top and two more chairs on the other side. In the northeast corner is a small wardrobe containing fine clothes with a couple of shelves above holding a bottle of spiced wine and a set of shelves to the left holding a large coin purse, a common book, a ruined book and two deathbell flowers. To the right of the desk are three bookcases coming out from the north wall partitioning this area from the sleeping area. On the shelves are seven common books and two pieces of silver ore. Beside these is a corner unit with a candlestick and a common book on top. To the left beyond the bookcases is the sleeping area containing a single owned bed in the northwest corner, with an end table beside it with a common book on top. A wash basin behind the bookcases and a small wardrobe with two green apples and one red apple on top. At the top of the stairs to the south is a T-junction with the general's bedroom to the right and a corridor leading to a door outside to the left. The bedroom contains a large owned double bed coming out from the northwestern corner with an end table behind holding a potion of minor healing, a potion of minor magicka and a common book. There are wall shelves above this, one of which holds a bottle of spiced wine, while the other holds an Imperial helmet, sword and bracers. At the foot of the bed is a long unlocked non-respawning chest containing random items, with a pair of Imperial boots beside the bed. Against the west wall is a small wardrobe with two red and a green apple on top. A chair and wooden bench are against the south wall and a narrow table with a wall shelves above holding a bunch of lavender and a wash basin beside it. In the northeastern corner is an alcove with two tall and one small wardrobes all containing fine clothes. The corridor to the left has a set of shelves against the north wall part way along holding a potion of minor stamina, an Imperial shield, a pair of Imperial boots and a pair of Imperial light boots. The door leads out onto the walls surround Solitude and the castle courtyard. The stairs descending to the north from the antechamber leads to the kitchen and barracks for the cities guards and where you will find Captain Aldis at night. The kitchen contains three long wooden tables, stacks of crates against the south wall with one of the tables and bench in front. On the table are two pieces of cooked beef, three garlic bulbs, a couple of loaves of bread, a wedge of cheese and an empty wine bottle. In the southeastern corner is a stack of food barrels, with a rack holding two haunches of raw horse meat and one haunch of raw venison in front. In the middle of the east wall is an oven with an empty metal pot inside. A table is in front with a bucket of potatoes underneath. On the table are three seared slaughterfish steaks, a leek, a cabbage, two potatoes, a garlic bulb, three loaves of bread and a sliced eidar cheese. To the left of the oven are two wall shelves holding three loaves of bread, two potatoes and a sliced eidar cheese, with two bunches of dried elves ear, a garlic braid and a bunch of dried frost mirriam hanging above them. To the left is another stack of food barrels. In front of these is the third table and three chairs, with three pieces of cooked beef, two pieces of bread and three empty wine bottles on top the table. Opposite the stairs is an unlocked metal gate with a storeroom behind containing sixteen weapon racks on the walls holding many Imperial sword, and at the end is a small unit holding an Imperial helmet, an Imperial light helmet, an Imperial cuirass, a pairs of Imperial bracers, three potions of minor healing, a potion of minor magicka, and a potion of minor stamina. Beside the unit is a pair of Imperial boots on one side and a pair of Imperial light boots and an Imperial shield on the other. A second Imperial shield is against the left-hand wall. To the left at the bottom of the stairs are the sleeping quarters with a round wooden table with a copy of the Light Armor skill book The Rear Guard on top. There are a total of nine single owned beds all coming out from the north and south walls with five end tables between them, mostly empty, but one has a bottle of wine and a bottle of alto wine on top. There are two pairs of iron boots and two pairs of Imperial boots beside some of the beds and three Imperial helmets and a bottle of wine on shelves above some of the beds. The stairs descending to the south lead down to a door to Castle Dour Dungeon. The dungeon is located in the basement of Castle Dour and is circular, and serves as Solitude's jail, where you will be sent if you choose to be jailed to pay for any crimes committed in Haafingar. Entering the jail from the Castle above, brings you to a passage that leads onto a balcony above the lowest level where the cell are located. There is a small set of shelves on your left holding some ruined books and a common book. There are several hanging moss growing from the walls and ceiling in the dungeon. The balcony circles the rooms below. There are wide pillars at regular intervals around the balcony with a passage either in front or behind. There are many food sacks and barrels against the rear walls with a large coin purse on top of one at the start with a sprig of snowberries on the left. To the north is an unlocked door leading into a guards rest area. Beyond this are some chairs and an oven in the outer wall. Beyond this is an end table with a common book on top. To the west is a door leading to a torture chamber. Beyond this is a dresser against the outer wall containing clothes with a banded iron cuirass on top. Next to this are three wall shelves holding a troll skull, some ruined books and four common books. To the south is another door leading to another room. Past this door is a passage leading to stairs descending to the lower level with many barrels, sacks and crates against the walls. At the bottom of the stairs are some wall shelves opposite holding clutter. The passage continues to the west with a square table on the left holding a baked potato and beyond that is a set of shelves against the northeast wall holding two common books and a leveled potion of healing. The passage turns to the west here and further along, against the north wall is a set of shelves holding a pair of iron gauntlets, an iron cuirass and a bottle of wine with a pair of hide boots beside it. The passage leads around to the passage in front of the cells which are all level-locked, except the one you will be sent to if you are imprisoned, which will always be adept-locked. It contains a hay pile, a bucket containing a lockpick in the northwestern corner, a square wooden table and two chairs in the northeastern corner and by the southeast corner there is some crumbling mortar that can be activated to escape. Note that activating the crumbling wall will alert nearby guards, and cause the nearest one to investigate your cell, so make your way out quickly. The guard will leave the door of your cell open after investigating. This can be useful for a stealth-oriented player, as you can then leave your cell and pickpocket the Castle Dour dungeon key from one of the guards. Thus armed, you can unlock both the personal belongings and evidence chests. The cell to the left of yours is occupied, but you cannot interact with the gate. There are a total of five level-locked cells to the right of your cell. Following the passage once you have activated the crumbling wall leads past a broken table with rubble crushing it from above with a leveled potion of stamina on top. Just after this is a chair with a leveled war axe on top. The passage descends a long flight of stairs with a barrel part way down with a medium coin purse on top. At the bottom is a small room with a ladder leader back out into Solitude. You come out behind Angeline's Aromatics on a level above ground. The room to the south contains a long wooden table and chair, a set of shelves against the west wall holding two common books, some bread, and cheese, a bunch of lavender and a sprig of snowberries. There is a fireplace in the north wall with some leveled boots nearby, and stair at the back of the room, descending to the south. At the bottom is a round wooden table and two chairs with two bottles of Nord mead on top of the table. Against the north wall are several crates and food sacks, while against the west wall are some wall shelves holding an iron sword and war axe, a pair of leather bracers and an empty petty soul gem. To the left is a wooden table with an iron helmet, leveled bracers, a leveled sword, a leveled battleaxe, and a leveled curiass on top and a pair of leather boots underneath. Against the south wall is the evidence chest as well as a leveled warhammer and soul gem, while to the left, in the southeastern corner is a stack of barrels, one of which containing ingredients. Against the east wall is a table with the prisoner belonging chest on top and a hole in the wall, through which you can access the chest if escaping your cell through the crumbling wall. The torture chamber to the west contains two small cages hanging from the ceiling, a dead prisoner who can be looted for a few septims in one of them and a rack between them. Against the north wall is a set of shelves holding some ruined books and a leveled helmet, while at the rear of the room is a table covered in blood, with a leveled dagger on it. The room to the north contains a long wooden table and two chairs with a portion of grilled leeks, a salmon steak, a piece of clam meat and a bottle of alto wine on top. At the rear of the room are two sets of shelves holding a total of three common books, an iron cuirass, a pair of hide bracers, an iron helmet, two iron daggers, a small coin purse, and a pair of leveled bracers. The entrance to this is separate from the rest of the castle and leads into an audience chamber with a cupboard on your left, a small sitting area on the right consisting of a wooden bench with a low table in front and a small cupboard to the right with a plate of bread and cheese and a common book on top. A pair of wooden benches and a pair of narrow tables are against the side walls, while at the far end on a raised dias is a large throne. To the right of this is a long unlocked non-respawning chest containing random items. Along the east side of the room is a passage leading back to the kitchens, on your left just before the kitchen is a storage area containing barrels, sacks, crates and a set of shelves with a bunch of lavender, a bottle of wine, a bottle of spiced wine, and two bottles of Honningbrew Mead. The kitchen contains a central cooking pot with small units on either side and an oven behind. If you are here as part of the Dark Brotherhood quest To Kill an Empire Then Gianna will be standing by the cooking pot, but she won't speak with you until you are wearing a chef's hat. Against the east wall are some shelves that hold several chef's hats and have two garlic braids hanging in front. To the right are more shelves holding several loaves of bread and a sliced eidar cheese and a potato, with two bunches of dried elves ear, a garlic braid and a bunch of frost mirriam hanging in front. To the south are more shelves holding a baked potato, a potato, many pieces of cheese, several loaves of bread, a fillet of salmon meat, a salmon steak, a seared slaughterfish steak, and a slaughterfish egg. Hanging above these shelves are six bunches of dried elves ear, a garlic braid and a bunch of frost mirriam. When standing behind the cooking pot facing north, on the right-hand unit is two carrots, two cabbage, six tomatoes, three bulbs of garlic, two chaurus eggs, a fillet of horker meat, a bottle of Black-Briar Mead and a copy of Uncommon Taste. While hanging over it are two bunches of dried elves ear, two garlic braids and a bunch of dried frost mirriam. At the end are three open crates in a stack containing three bottles of alto wine, two bottles of wine and two empty wine bottles. On the left-hand unit are two giant's toes, a haunch of raw venison, a leek, a raw rabbit leg, three loose septims, a bulb of garlic, a bowl of vampire dust, a bowl of frost salts, three red apples, a thistle branch and two gourds. Hanging over this are three whole salmon and an open crate beside it containing four potatoes. Against the west wall are two more open crates stacked on top of each other, the top one holds two wheels of cheese, and the bottom one contains a gourd, a sample of fly amanita fungus, an orange dartwing and a rock warbler egg. South of these are more shelves holding a fillet of horker meat, a joint of raw beef, a rack of dog meat, two charred skeever hides, and several pieces of cheese. Hanging in front of these is a pheasant, three rabbits, a salmon, two haunches of raw horse meat and a haunch of raw venison. To the west are two more open crates containing loaves of bread and wheels of cheese. South of these are more food barrels. Against the west wall of the audience chamber is a narrow wooden table with a stone bowl containing a bunch of lavender, a bulb of garlic, a sprig of snowberries, a blue and a purple mountain flower on top. To the left are stairs leading up to a passage with a door ahead and the passage turning to the left. The passage overlooks the room below. At the far end is a room that is locked and requires a key.--This is a dining room and can only be accessed during the related quest. In front of this is a sitting area with two wooden benches with a low table in front and a copy of the Enchanting skill book Catalogue of Weapon Enchantments. The room at the other end of the passage is the Emperor's sleeping quarters and contains a large owned four-poster double bed coming out from the southwest corner, with a long unlocked non-respawning chest containing random items at the foot of the bed and an end table to the right with a common book on top. Against the west wall is a small wardrobe with a candlestick, and a green and two red apples on top. There is a chair against the north wall and a wooden bench and wash basin against the west wall. Against the south wall is another bench, a narrow table to the left and beside this a corner unit with a ruined book on top. Opposite this is a dressing area containing two tall wardrobes containing fine clothes. Infinite steel arrows can be obtained by watching the guards practice archery. Just take the arrows from the targets they use for practice. There is an Escape shadowmark in the dungeon on the floor next to the collapsible wall. The escape route is behind that collapsible wall. If Battle for Solitude is completed, Istar Cairn-Breaker will move to Castle Dour. Should the Stormcloaks win the Civil War, guard patrols inside Castle Dour will be comparatively lax - the Imperial guards that used to patrol the interior and guard the door will not be replaced. The same is true for the Palace of the Kings should the Empire win the war - the guards patrolling the upstairs living quarters will not be replaced after the Empire wins the war. There was initially going to be an extra area in Castle Dour, called Castle Dour, Tower, which would have connected the main area of the castle (with the entrance being in General Tullius' bedroom) to the top of the tower which is currently inaccessible. Game data indicates that this area would have been used as an escape route by General Tullius in the Battle of Solitude, leading to a final showdown with him on the battlements. This area still exists and is completely furnished, but inaccessible. All end tables, cupboards, and dressers in the location are non-respawning and safe to store items in. One of the doors to the Emperor's Tower is not properly locked prior to To Kill an Empire which can cause some of the quest triggers inside to break. This page was last modified on 12 April 2019, at 04:08.